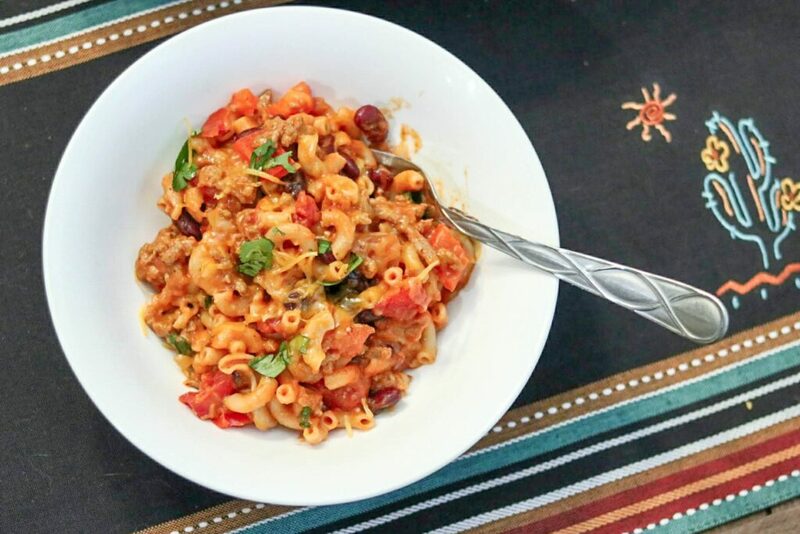 We’re bringing childhood back, with this easy Skillet Turkey Chili Mac. Lightened up with turkey vs beef, and packing a protein punch – this one is a family favorite! Ever eat this as a kid? I didn’t, but I didn’t grow up in the US. It’s freaking delicious though, and I’m making up for my lacking childhood (sorry Mum) by making this for my family. With a 30 minute start to finish, this is perfect for a week night. However, I typically make this ahead because the flavors are even better the next day. PLUS, it’s all made in ONE SKILLET – which is awesome for those of you that have to do the dishes. I know that not everyone agrees with me that beans belong in chili, but I think they add a fabulous protein boost, and with the turkey – it’s not quite as high in fat as if I’d used ground beef. Feel free to leave out the beans, and sub ground beef for turkey – I won’t be mad at you! Super simple ingredients, nothing fancy – and you probably already have everything hanging out in your pantry/fridge already! What’s YOUR favorite dinner that your mom used to make you as a kid? Want more weeknight winners? Of course you do! Add the onion, bell peppers and cook until vegetable soften. Stir in the garlic, chili powder, cumin, red pepper flakes, salt and pepper and cook for about 30 seconds, then add the macaroni, diced tomatoes, tomato sauce, beans and water. Cover and bring to a simmer, then reduce heat to medium-low and simmer until pasta is tender (about 10-15 mins), stirring regularly. Check for seasoning and add more if needed. Remove from heat, and fold in the shredded cheese. Oh yum! This would be a huge hit with my family! They are going to love it when I make this for them. 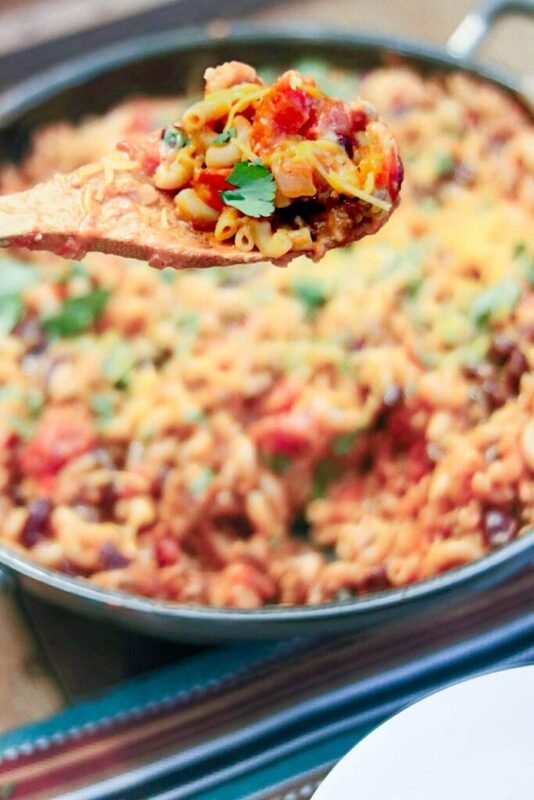 I love a good one pot recipe, so easy and fewer dishes – you can’t beat that! My husband would love this dish. I do think beans belong in chili, but I don’t think they belong in pasta LOL. I totally agree that there is always room for more garlic! I did have this growing up, but with beef instead of turkey. I like that you ditched the beef and added turkey. It looks so delicious. This looks like my kind of meal. I think everyone in the house would like it! And I’m with you, there’s always room for garlic. I put so much of it in my foods! Your photography is awesome, Kylee. I love what you have done here, my kids are going to love this recipe. I will have my son make it this weekend for sure. 🙂 I grew up in the US and my mom never served this to us–wonder what region of the country it originated? Thanks for sharing. I love using my skillet for different recipes that’s packed with flavor! This sounds so good and I love the combination of chili and turkey! I love beans in chili, but I like my chili mac beanless. I’m a weirdo. This is a great meal option. 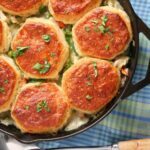 I like that is is made in a skillet so it is quick and easy to make during the week for dinner. Leftovers of this would be great too for lunch the next day! Yum! Comfort food at its finest! This will definitely be on our menu plan next week. I will have to leave out the beans though. I am the only one in my family that loves beans, so since I am the minority, I’d have to leave those yummy little things out. Thanks for sharing the recipe! Sometimes I like bean in my chili and other times notsomuch but they really are a great addition if you’re looking to make a dish more filling. This is my kind of recipe! I love the combination of flavors with macaroni. Adding it to my menu! That is one filling meal. It has some really great ingredients and looks delicious! 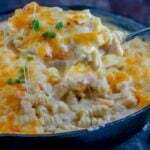 This looks like yummy comfort food that I’d like to try! I love that you put cilantro on top. My favorite! This sounds delicious. Unfortunately I love beans but my OH won’t eat them, and while I fancy the turkey mince, he’d want beef. But I reckon I might try it anyway and see if my son will eat it. 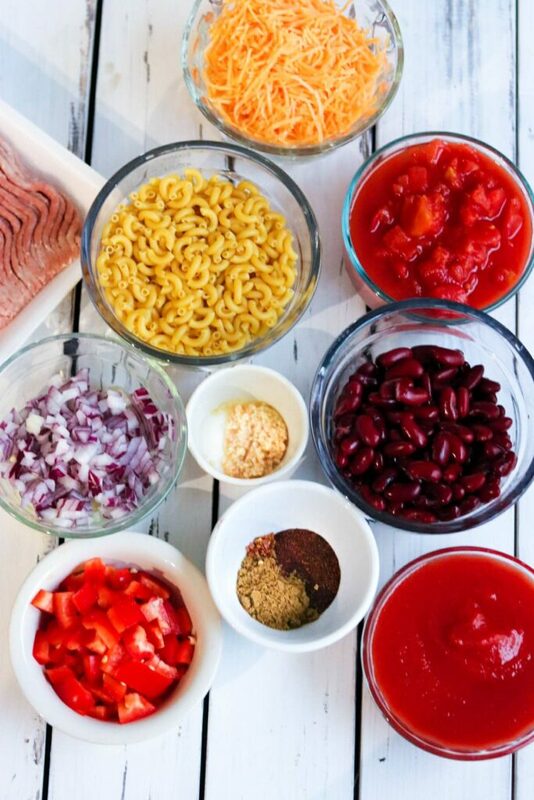 We love chili and we love mac and cheese so I bet that my boys would devour this recipe. Looks like a hearty meal, perfect for Spring when my boys are outside and get a good work out. My DIL makes her chili similar to this and it’s divine. I love chili every which way I find recipes for. I’m saving this one for a cold weekend coming up. Really like your recipe. 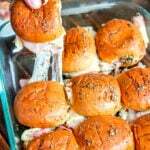 Lighter with the turkey and packed with protein from the beans. Cumin is so essential for seasoning the meat – it is one of our absolute favorite spices! Oh this is so nice. I would love to make this and serve to my girlfriends as they will be visiting my house over the weekends. Never tried cumin but hopefully I can make it successfully! This rises to the top of my to-make list. Just told my youngest. Her reaction: mmm. I dig the idea of switching up the beans and other ingredients. It’s like a different dish every time.